Following the end of Paul Bignot's career with the Harriers yesterday today saw the arrival of the player tipped to replace him on the payroll but not in his position. The former Weymouth midfielder/striker/defender Chris McPhee has signed for us until the end of this season and should feature in the team that faces his hometown club, Eastbourne, on Saturday. He started his footballing career at Brighton back in 1999 and played in a generous amount of games in his seven years with them. 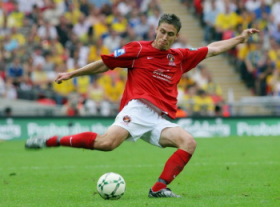 He left them in 2006 to join up with Torquay Utd after a couple of times out on loan to Aldershot and Swindon. He lasted just the one term for them before joining Ebbsfleet Utd and then only going and scoring the winner against his former side in the FA Trophy Final last season. He joined up with Weymouth at the start of this season but the financial problems at the Wessex Stadium saw him, and the bulk of the first team, walking out on the club last week. The Harriers fans will be hoping that his arrival will re-ignite our receding promotion hopes.